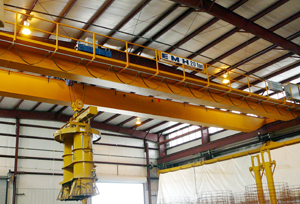 EMH Overhead Cranes in Concrete Product Manufacturing | EMH, Inc.
A 20 ton crane is used with a Hawkeye machine to manufacture concrete pipe at a Southern precast plant. 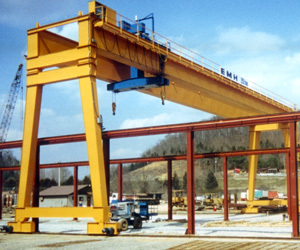 Two 15-ton, double girder, bridge cranes load prefabricated concrete components for shipment at a Kentucky precast manufacturing facility. 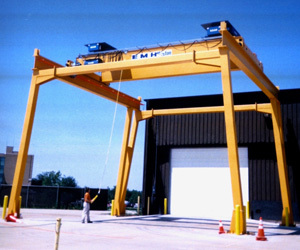 This freestanding 40/20 ton double girder crane handles protective concrete casings for telecommunication equipment. A 25 ton, 120 foot outdoor gantry loads wall panels onto flatbed trucks. 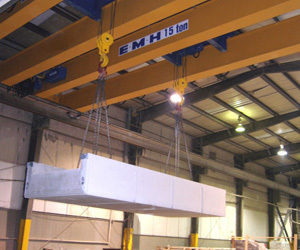 A single rotating "hammerhead" hoist, designed and built by EMH, provides precise positioning of the load.